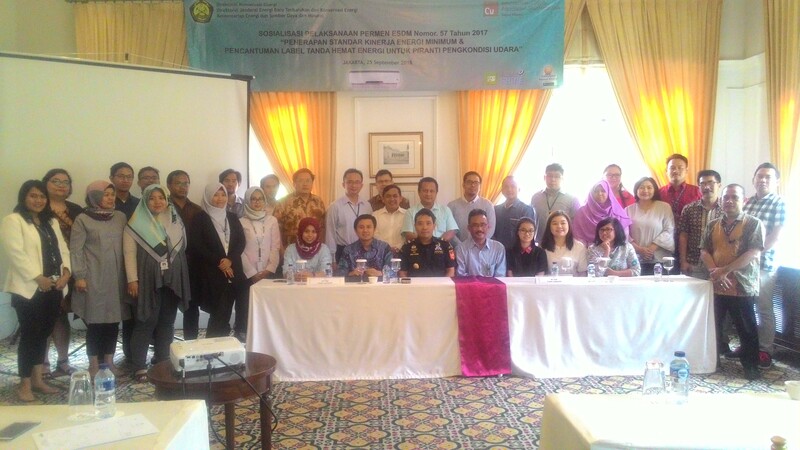 With financial support from the ASEAN SHINE program and the International Copper Association Southeast Asia (ICA), in partnership with the Directorate of Energy Conservation (DEC), the Ministry of Energy and Mineral Resources (MEMR), Indonesia, held the second Socialization Event of the 2nd Tier of Air-Conditioner Minimum Energy Performance Standard (MEPS) on 25 September 2018 at Hermitage Hotel, Jakarta, Indonesia, following the first Socialization Event on 10 August 2018 in Surabaya. The second event has, once again, successfully drawn a number of attendances by local government and major manufacturers attending the event to leverage a mutual understanding and future implementation and collaboration according to the latest Ministry of Energy Regulation No. 57/2017. The second Socialization Event of the 2nd Tier of AC MEPS Implementation would emphasize on the initiation of a great impact on local energy savings and market transformation. The gathering of the related government sectors such the Ministry of Energy Directorate Energy Conservation (DEC), Ministry of Trade (MoT) and Ministry of Finance (MoF), and air-conditioner manufacturing sector shows the country’s main focus and professional commitment on the 2nd tier MEPS implementation alongside with its neighbours; Thailand, Malaysia and Vietnam who pre-started the continuing of AC MEPS implementation following the ASEAN SHINE program, which led to the adoption of ASEAN-level and national-level policies for the promotion of highly efficient AC, which will contribute to reducing ASEAN’s annual energy consumption by 24,173 GWh and greenhouse gas emissions by 13.9 million tonnes by 2020 and will further yield an unstoppable impact to the Southeast Asia region and later the global transformation according to the mitigation of climate change policy as stated in the Paris Agreement.